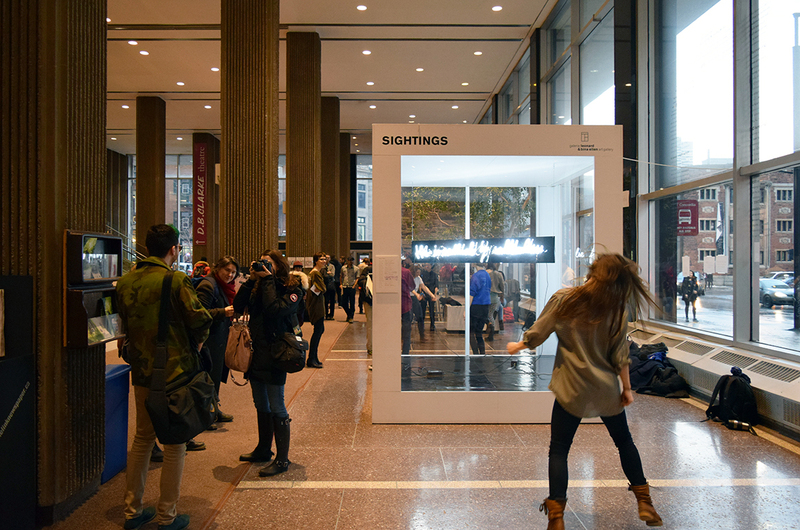 Launched in 2012 in celebration of the 50th anniversary of the Leonard & Bina Ellen Art Gallery’s Permanent Collection, the SIGHTINGS satellite exhibition program was conceived as an experimental platform to critically reflect upon the possibilities and limitations of the modernist “white cube”. 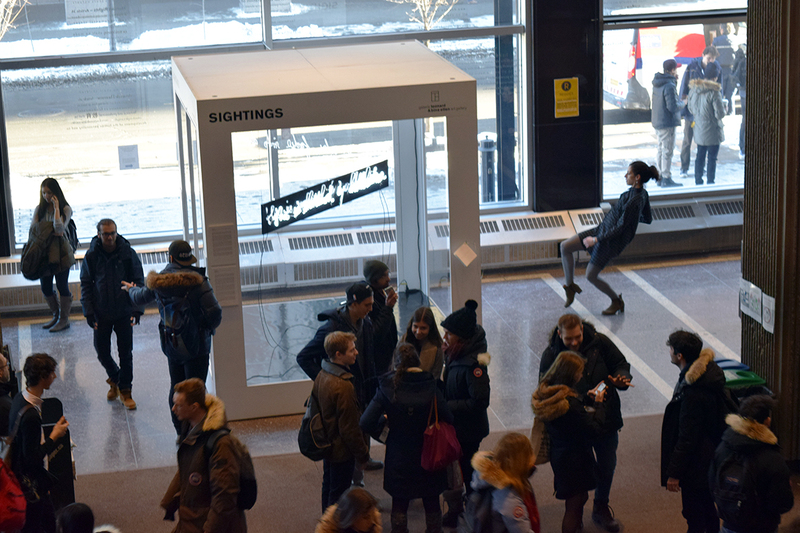 For the 2015-16 programming year, artists and curators are invited to examine more closely the invisible mechanisms that condition the production and circulation of art, and to propose new strategies to present them to the public. Focused on the notion of labour and the issues raised by an “immaterial” cultural economy, the projects developed over the next few months will investigate aspects of the art system that are usually overlooked by viewers. Among these are the distribution of roles among art world protagonists (curators, artists, technicians, assistants, programmers etc. ); the tensions that govern their respective activities; and the division of labour (between manual and intellectual work, between conception and making, and between creative and discursive production). Simon Portigal is a graduate of P.A.R.T.S. and LADMMI. Now based in Montreal, he has worked for Dancemakers and with a number of independent artists, including Adam Kinner, Ame Henderson/Public Recordings, Dana Michel, Ellen Furey, Benjamin Kamino, Brendan Fernandes, and Marten Spangberg. Benoît Lachambre is a choreographer, performer, improviser, and teacher. In 1996, he founded the company Par B.L.eux with the goal of creating and producing works in a spirit of openness and collaboration while developing interdisciplinary rapports within dance. Samantha “Sam I Am Montolla” Hinds, a Waacker, Hip Hop dancer and singer/songwriter was born and raised in Montreal. She is part of the internationally known IHOW The Canadian Chapter as Princess Shayla and has won dance battles in Paris, New York, and in her hometown in Waacking, Hip Hop and All-Styles. 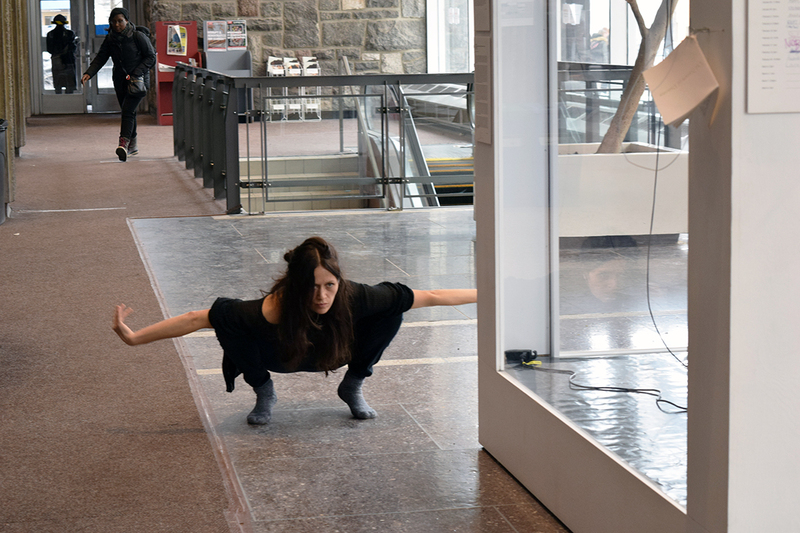 Rebecca Redher is a performer and dance maker from Montreal. Having recently completed her bachelors in contemporary dance at Concordia University (2014), she is now pursuing her choreographic research and collaborating with artists that inspire her. Marie Claire Forté aime penser qu’on peut toujours élargir notre champ perceptuel; inclure plus, comprendre plus, jouir plus… As a choreographer and dancer, and through a variety of constellations, she instigates projects and collaborates in those of others. Conjointement à sa pratique artistique, elle traduit, écrit et enseigne la danse. Trained as a musician, Adam Kinner is an artist who has worked across the music, dance and visual arts milieux. He has performed extensively across the US, Canada and Europe and regularly collaborates with artists working in diverse performance contexts. He is currently finishing an M.A. at Concordia University in interdisciplinary performance studies. 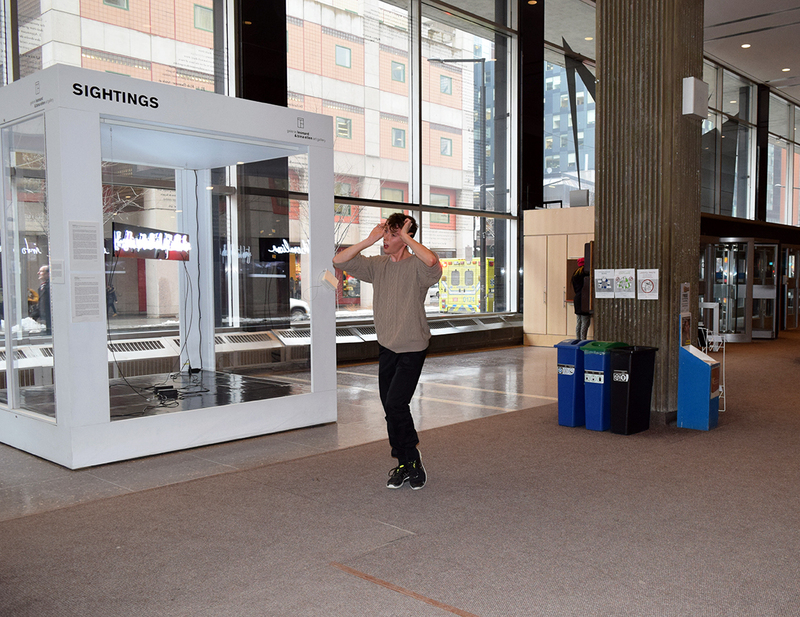 Stephen Quinlan is an interdisciplinary artist whose practice resides at the cross roads of puppetry and dance. Since graduating from Memorial University of Newfoundland’s School of Music, with an undergrad in classical singing, he has oscillated between numerous disciplines; always investigating, forever evolving. Antonija Livingstone is an independent artist based in Berlin, working at the frontiers of dance and performance. Her work is often born of collaborations with visual artists, dancers and strangers with whom she establishes the choreography as a curatorial practice. Her events, or time-based sculptures, prioritize rare presences and endangered practices. Antonija’s presence and practice are affiliated with Nobody’s Business. 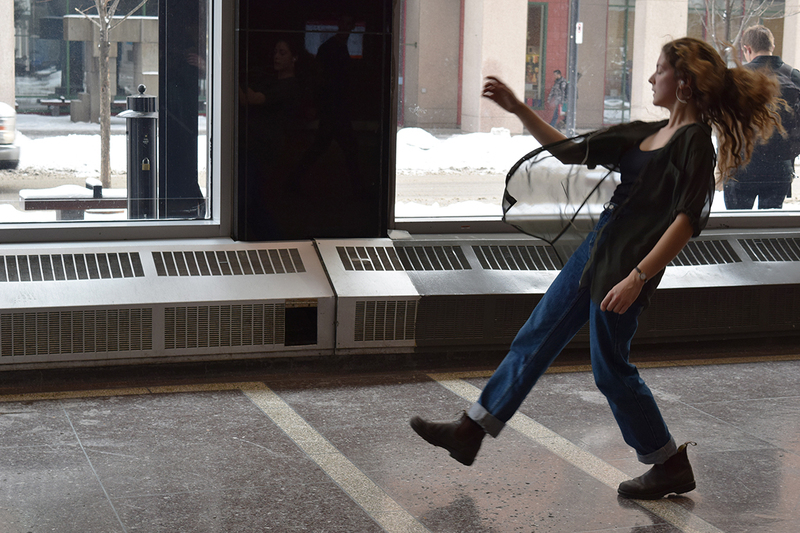 Caroline Gravel is a dance artist based in Montreal. Her work is an investigation of the relation of sensations to the body and their emotional and perceptive resonances. She creates evocative atmospheres without narratives. The drama is somewhere else but the tension crystallizes to embody a constantly evolving event. Based in Montreal, Audrée Juteau worked as a dancer on many projects with various choreographers including Sonya Biernath, Katie Ward, Jean- Pierre Perreault Foundation, Deborah Dunn (cie Trial & Eros)… Her first experiences as a choreographer happened within the collective The Choreographers. Her works Poisson, Youme and Sam affecte were recently presented. She graduated from LADMMI in 2003; she was also the recipient of the Impulstanz Danceweb 2010. In 2015, she completed a master’s degree in dance at UQAM. Montreal based dancer Leah McFly, also known as Waackeisha from 2 Marvelous Productions, takes hip hop to a whole new level with her pure energy and attitude. She has captivated audiences all over the world with her passion for fashion, versatility and mastery in various dance styles including hip hop, popping, waacking, house and reggae/dancehall. 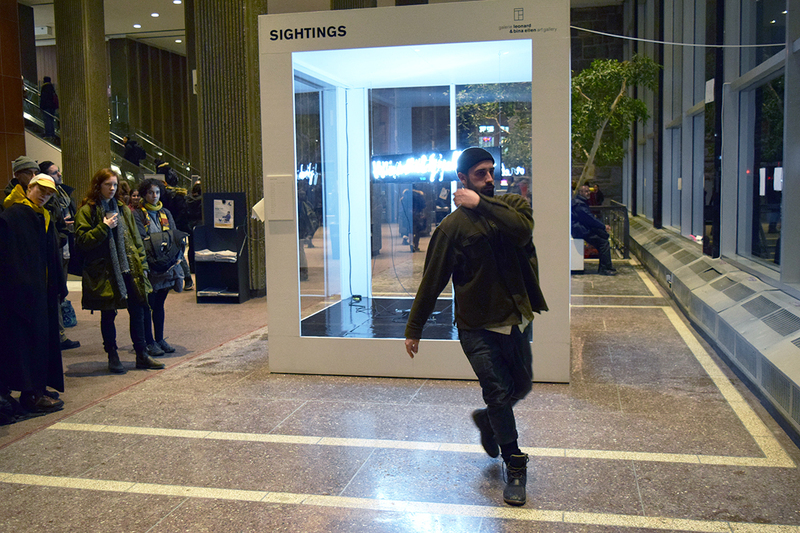 La calq’s work for SIGHTINGS combines three elements: a list of names of dancers, compiled online (thenamesofdancers.org) and displayed in a small book next to the cube; a neon sign that hangs in the cube and reads “this is swallowed by neoliberalism or else fades into obscurity”; and a series of solo dances that take place in the surrounding space over the eight-week duration. At the core of this work is a list of names of dancers. Sourced from the dance community at large, this ever-morphing list of names composes a collective choreographic field. By naming dancers, the list brings the commonality of dancing into the public realm while creating new relations between figures, some relatively unknown, some relatively famous. Their bodily acts are given an impossible monument, which gestures to unseen and heterogeneous movements, times and spaces. This voicing can be said to acknowledge dance’s historical and persistent pairing with the feminine (many of the names are those of women), but also in its cultural and historical diversity with the subaltern, and with the messiness and inefficiency of bodies themselves – bodies that inexorably age, leak, and break. 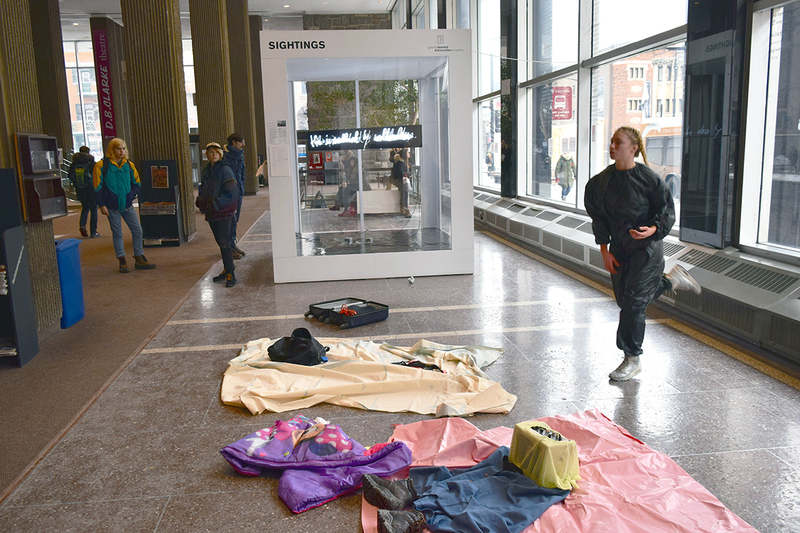 Not only does the performance of naming shed light onto given bodies and their linguistic materiality, but it also points to names as autonomous actors: as things, movements, affects, materials in themselves. In this way, The Names of Dancers tackles a prevailing regime of representation under neoliberal economy, which obscures and ingests certain dancing bodies, while locking others (it has “discovered”) into stable subject positions. The work engages and plays with such operations: it names and makes visible the labour of the dancing body, while persistently experimenting at thresholds of visibility and legibility. The neon sign names this threshold: the “or” between neoliberalism and obscurity. At the same time, it openly points to what is next to it through its use of the ambiguous “this”. “This” body, “this” work, “this” space, “this” sign, “this” dance. Simultaneously located and abstract (we are unsure, finally, which reading is “true,” if any), “this” is a performative utterance that is marked by a gesture of proximity, a gesture that always passes through the dancing body as it composes itself in relation to the world that presses against it. 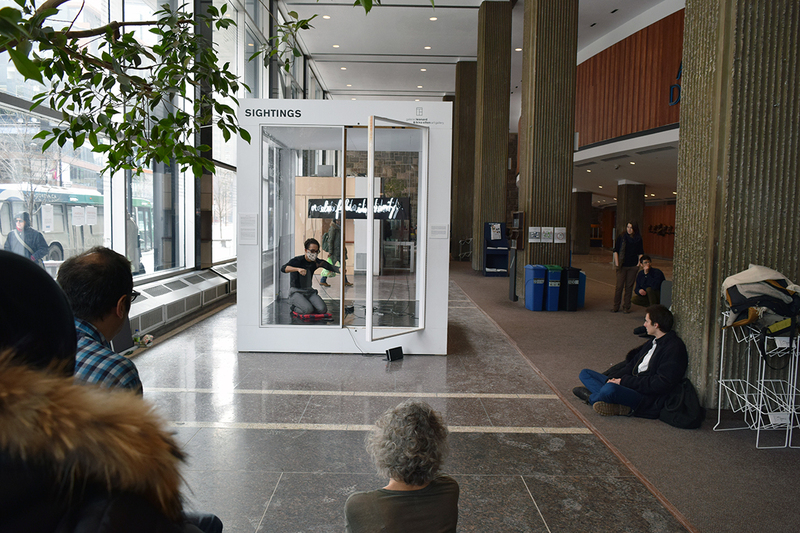 Throughout the presentation of the work, a series of dancers are invited to dance in proximity to the cube. Their performances are announced on this page as well as on a schedule on the side of the cube. As the surrounding area is quite busy with foot traffic, dance can be especially difficult to see in this context, or redundant – another body passing by. 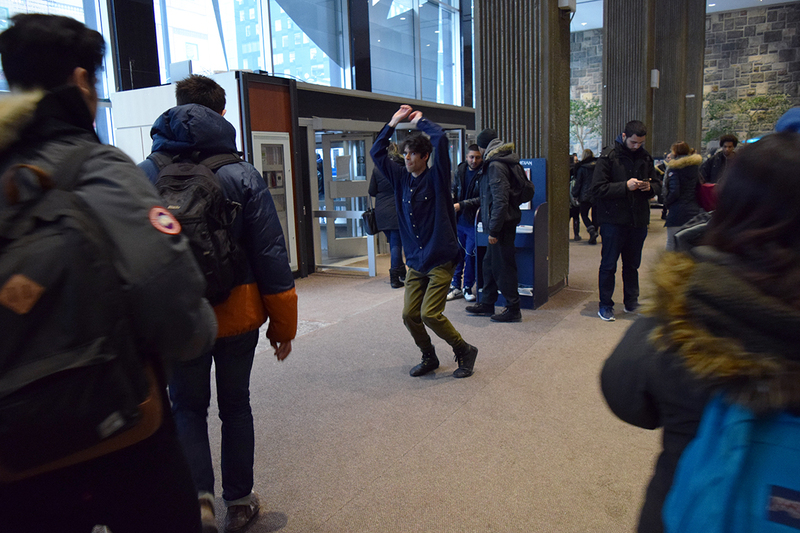 And yet, as these acts blur with and stand out from their surroundings, dancers play with excess and stillness on the limits of the highly regulated movements of public space. 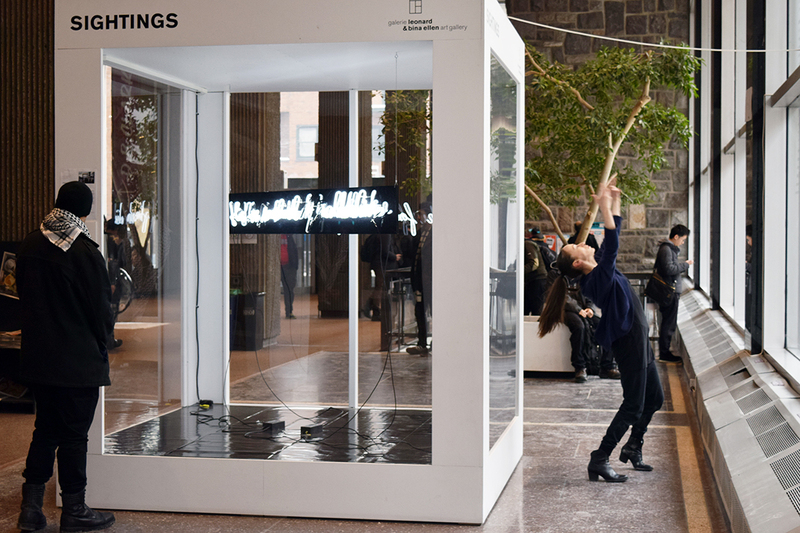 Combined with the list of names and the neon, their other-than-normative movements make a claim that we include divergent and experimental practices in the realm of the commons. Together, these elements prompt us to think of dance beyond its disciplinary techniques and usual spectacle in order to take seriously its capacity to invent practices of resistance and experimentation. To take dance seriously is to account for its political materiality: to acknowledge the ways in which it is shaped by a set of somatic and discursive technologies, which in turn enable dissident uses and assemblages. Faced with a series of minor, flickering, anonymous, singular, collective, nomadic, tangible yet abstract gestures, we are forced to question what counts as dance and to reimagine what it can do across an expanded field. La calq is an anonymous artist that is also a minor institution of dance committed to dancing experimental subjectivities. It assembles people, spaces, times, works, and processes that embody and move through new forms of togetherness. 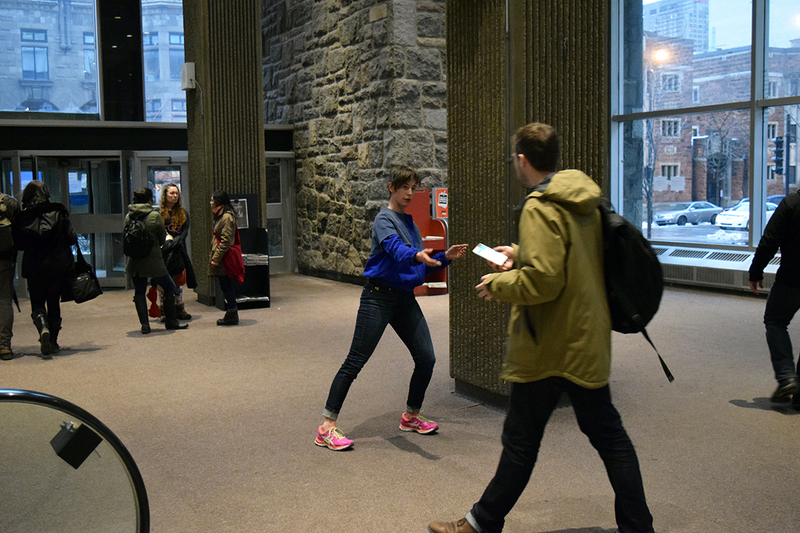 Taking its name from the Conseil des Arts et des Lettres du Québec, it uses the feminine in order to mount a challenge to institutions of cultural heritage and to highlight these institutions’ embeddedness in hegemonic political structures. La calq undoes the performance of cultural objectivity in its insistence that institutions of dance be minor, loose, ever in motion, and risk disappearing. At the threshold of visibility and on the collective surface of the body, La calq stages unworkable movements that invite ongoing dances of attentiveness.